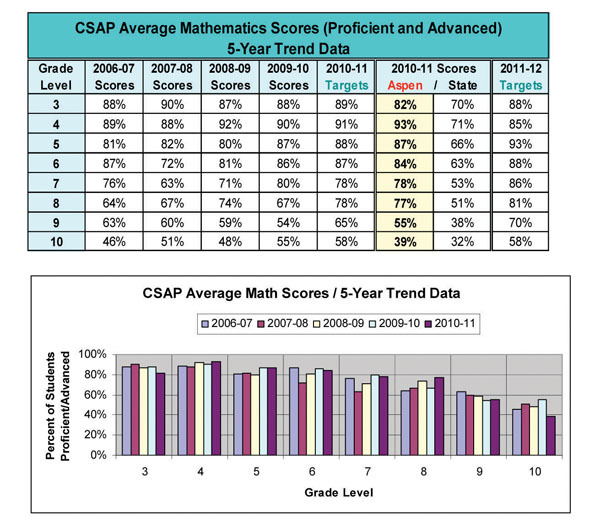 Source: Aspen School DistrictThe graphs above show CSAP math scores for the Aspen School District from 2006-07 through 2010-11. The Board of Education is concerned about the declining and "roller coaster" trends in the ninth and 10th grades. ASPEN – Reacting to what one Aspen school board member termed an “alarming” trend in standardized math test scores at certain grade levels, the Board of Education is taking a close look at the district’s performance in the subject area. The discussion came as part of the board’s ongoing academic achievement monitoring. But unlike most monitoring sessions, this nearly two-hour-long conversation ended with the board voting unanimously that “reasonable progress is being made, with the following exceptions” – namely, not meeting the target CSAP math scores for ninth- and 10th-graders. According to data presented at the meeting, in 2009-10, 55 percent of 10th-graders score proficient or above; in 2010-11, that number dropped to 39 percent. The target was 58 percent. Sophomores also missed their target, in this case by 15 percentage points. “Two cohort groups (grade eight to nine, and grade nine to 10) experienced a significant decrease which has been attributed to continuing factors,” noted assistant superintendent Dr. Julia Roark in her report to the school board. 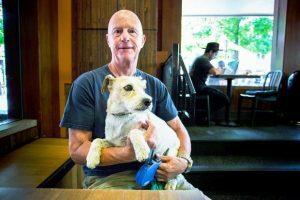 Among those factors are recent changes to the math curriculum, as well as a shift in math philosophy in general – both of which take time to show marked results. Regardless, the scores remained a concern. “We could respond to this with excuses and explanations, but that’s not the proper way to deal with it,” said Aspen High School math teacher Jamie Hozack. 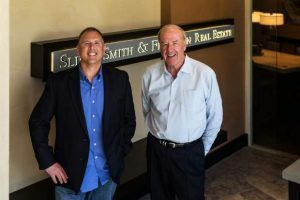 “So we are here to talk with you all about what is going on and what actions we are taking. Indeed, board members acknowledged that Aspen’s scores are still above state averages – which are 38 and 32 percent proficient or above for ninth and 10th grades, respectively – but they remain concerned. 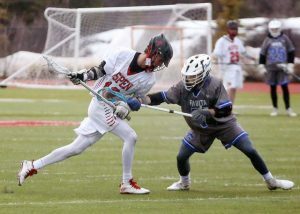 They pointed to the scores of Colorado Match high schools like Cherry Creek, Cheyenne Mountain and Steamboat Springs, all of which scored significantly above Aspen in 2010-11. All of those involved in the conversation agreed that the district’s math departments are trying to improve student performance. The question of how to create results, however, remained. In the end, the board voted to note the exceptions to “reasonable progress” so the topic can be monitored more closely. The board is also planning a separate work session with the mathematics staff to discuss strategies for continued change, as well as the possibility of a communication forum to parents. “You read as a family all year long, but math is not a daily family activity,” noted Sarah Beesley, a math teacher at Aspen Middle School.